On Sunday 2 April 1916, 57 police raided the Ngāi Tūhoe settlement of Maungapōhatu in the Urewera Ranges. By 1907 prophet and community leader Rua Kēnana had attracted a following of 600 people. Many Pākehā saw the avowedly autonomous kāinga as subversive. Māori politicians like Māui Pōmare and Āpirana Ngata believed that traditional tohunga (spiritual leaders) such as Rua inhibited Māori progress. In 1915 Rua was charged with illicitly selling alcohol. Concerned about his opposition to Tūhoe men enlisting for military service, the government seized this opportunity to punish him. After Rua failed to appear before a magistrate when summonsed in January 1916, Police Commissioner John Cullen instigated an armed police expedition to Maungapōhatu. In an exchange of gunfire probably begun by the police, two Māori were killed, including Rua’s son Toko. Rua and others were arrested on charges ranging from resisting arrest to treason, and taken to Auckland for trial. Rua was sentenced to 12 months’ hard labour followed by 18 months’ imprisonment. Rua was released from jail in April 1918, but the Maungapōhatu community never recovered. 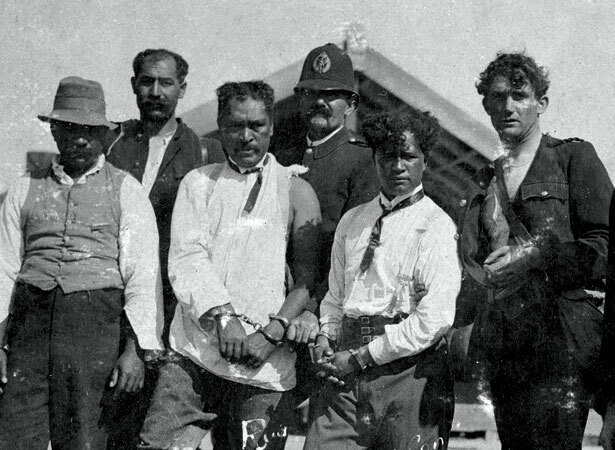 We have 9 biographies, 5 articles, related to Arrest of Rua Kēnana.